Power saving mode can be found in almost all Android devices. It is not new. Most Android users know that one enabled, CPU tends to run slower and the number of active background process may be limited. In other words, power saving mode in existing Android devices usually slightly degrade the performance of the device to gain longer battery life. In Galaxy S5, in addition to such normal (or traditional methods), Samsung did more compared to other Android vendors. According to this report, and this press release, Samsung partnered with Lucidlogix to optimize the battery life optimization by integrating Lucidlogix’s PowerXtend Software in Galaxy S5. It is claimed that the said software can boosts 35% more play time without sacrificing the performance (user experience). Samsung did not disclose how the software is integrated in Galaxy S5. But in power saving mode, such software must play an important role. Otherwise, the mere 2800mAh battery is hard to provide 12-hour video playback or 10-hour web browsing. Another interesting power saving feature is that you can change the screen from color to grayscale when normal power saving mode is enabled. Of course, you can switch them at any time. The most impressive and interesting power saving feature in Galaxy S5 is the totally new Galaxy S5 ultra power saving mode. Samsung claims that Galaxy S5 ultra power saving mode can provide up to 24 hours of stand-by with 10% battery. Don’t confuse this 24-hour standby time with the standby in specifications. This 24 hours standby means you can turn on all network connections, and receiving all notifications. While in the hardware specification sheet, the 390-hour standby means voice only. With the Galaxy S5 ultra power saving mode on, S5’s display will show only black and white colors and offer access to a certain set of applications. The ultra power saving mode also shuts down all unnecessary features in your S5. No other mainstream smartphones provide this feature yet. Some users definitely will find this feature is a life-saver. How does Galaxy S5 Ultra Power Saving Mode save battery? Can I customize the apps available for Galaxy S5 Ultra Power Saving Mode? In ultra power saving mode, you’ll have access to some basic apps, like the ability to send text messages, make phone calls, and browse the web with Samsung’s browser. You can add some other apps available when your Galaxy S5 is in ultra power saving mode. Of course, the apps are limited to some stock apps only. This includes, Phone, Messaging, Internet, Calculator, Google+, ChatON, Memo, Voice recorder and Clock. So, the answer is yes, but limited to some stock apps for basic functionalities. Very likely, through future update, Samsung will allow more apps in ultra power saving mode. Do you have any questions on Galaxy S5 Ultra Power Saving Mode? Please let us know in the comment box below. Is it possible to still have the bluetooth on when in Ultra Power Saving Mode? It would be nice to be able to have the mode on but still have the bluetooth connect to my car when driving. Bluetooth will be turned off. But I’m not sure whether you can manually enable it once ultra power saving mode is activated. We will try it once we get the handset in April. will s4 get this powerextend software?? 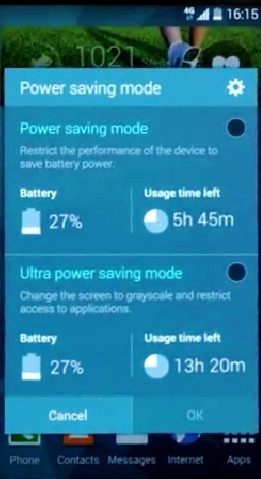 would it be possible to use ultra saving mode of s5 on note 3 ? There are no official words on the availability of this feature in Note 3. We have to wait for next major update for Note 3 to see whether Samsung ports this feature to Note 3. How I can schedule ultra power saving when I going to sleep? Normally, the ultra power saving is needed when the battery level is low but you are far from charger. In the night, if it is not in use the battery drain is negligible, normally less than 5% per night. Is there a way to set power saving mode, or ultra power saving mode to automatically activate at specified battery levels? Can I add email to the home screen when in ultra power save mode? Probably in the future, more apps will be allowed. Are you able to change the apps you’ve selected for Ultra Power Saving mode? I picked them when I got it and they’re not really the ones I’d need most but can’t work out how to change them (if it’s possible). You can only select apps from the list. This list is still very limited and you cannot add your own apps. Right, but that’s not what I asked. I want to know if I can change the apps that I have already picked – when you first use it there are 3 pre-set and 3 you can add from the list. I want to change one or more of those that I picked for others on this list. Is this possible? No, at this time. 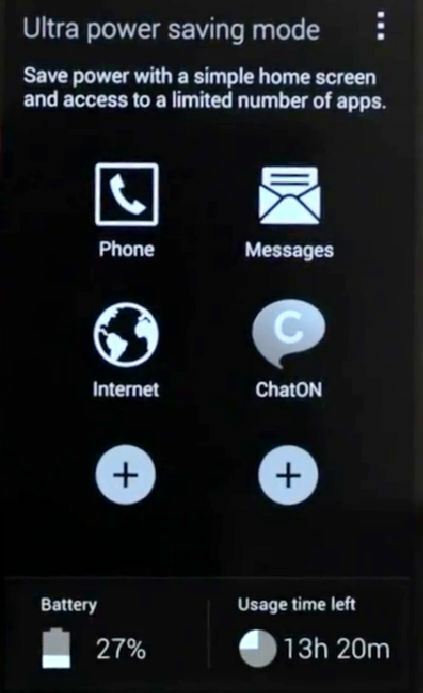 Maybe, in some future update, Samsung will allow this, or at least we’ll give more options. Vicki — You probably have figured this out by now, but yes, it is possible to “change one or more of those for others on this list.” Tap the menu (three little buttons to the right of “Ultra Power Saving Mode” You should get three choices, the middle of which is “Remove.” Select “Remove, select the apps you wish to do away with, and you will be able to put different ones in the newly opened slots. What sms app works in ultra power saving mode? I am not able to send text message when I select this mode. Is it possible to activate the Ultra Power Mode in a App? Can you give me an example? Anyway, we will post a guide on this soon. How do I put the ultra power saving mode on the home screen? I don’t think there is a widget for it. You can swipe down from the status bar with two fingers to see the buttons. Of course, you can move the button into the first 8 so that you can access it even quicker (swipe down from status bar with one finger to get the button). Is there an automatic power on/off option? With my blackberry I had it shutdown at night and power on in the morning at a specific time. No, frequent power on/off is also not good for the device. The battery drain should normally be lower than 2-4% per night if you turn off WiFi and mobile data. If you want to avoid disturbance, you can enable blocking mode. You can do a comparison without enabling ultra power saving mode. The new battery may require a few charging cycles to get accurate reading. I have better battery life overnight even without enabling power saving, so it may be that too many apps are still on and running. If the battery life meets your expectations, you don’t need to change anything. Are there any auto power saving settings other than what I enable? It seems like my phone is shutting off WiFi lately and I don’t know why. My assumption was power saving settings but I can’t find anything. What I mean is, I don’t want my phone going into *any* power savings mode unless I tell it to. This is under WiFi settings. Go to settings – WiFi, tap menu key, tap advanced, you can then change the settings for keep WiFi on when sleeping. Ultra power saving mode should not harm your S5. But if you know your battery is enough before you can access a charger, it is not necessary to turn it on. Some apps will not be accessed when in ultra power saving mode. How do you prevent the rearranging of your apps on the homescreen after exiting ultra power save mode? Everytime I am done with the power save and it goes regular, almost all of my apps are rearranged or taken off of the home screen. I didn’t experienced this issue. Once exiting ultra power saving mode, the home screen should come back as that before entering ultra power saving mode. Are there new updates if we can modify the apps and add those that we really want? I’m NOT fond of using Google+, Line, chaton. It’s a waste of app selection for me. Then there is Facebook and although I do use that, I prefer just the messenger if I am to limit. Ultra power saving mode is not for day to day usage. Actually, you should avoid using apps. Frequently opening and closing apps actually is against the purpose of ultra power saving mode. It also shorten the battery time. Normal battery saving mode is usually sufficient for most users. The options for ultra power saving mode in s5 are still limited. Samsung didn’t allow much customization. This is Samsung’ first shot of this feature. Maybe in future versions, more options are available. But always remember, once ultra power saving is enabled, frequently using apps actually may consume more battery than the same operation in normal mode. Is there any update going to happen to add play books or an ereader to Ultra power saving mode? Samsung did mention more apps will be allowed. But it’s not clear how they make decisions on the allowed apps. But please note, ultra part saving mode is NOT designed for daily use. It’s a kind of emergency function. Using apps frequently actually may drain more battery than the similar activities in normal mode. It’s possible to define a % batery level to initialize automaticaly super power saving mode? Probably not. Actually when you battery is lower than 10% or 5%, some settings (brightness, background data…) are applied automatically, but not ultra power saving mode. Did you get the duplicated messages or just notifications? I cannot open messages when in ultra power saving mode. Any advice? I love the Ultra Power Saving Mode. But since the last Samsung Update, when I send texts in this mode, I no longer have access to the microphone for speaking my texts. Please help in what I can do to make this work like it used to. Are you using Samsung keyboard or Google keyboard? Hello everyone, someone should please help me out.I ON my power savings mode when my battery was low which shown a black and white screen and have access to limited application till it was off.I found a charger and charge it till it was full .The phone still shown black and white screen and I could not have access to disable the power saving mode.I only have access to Wi-Fi, network, sound,brightness,Airplane mode,location and display at the settings. And for the Applications I only have access to what’s app, message and chrome. someone should please help me out. 1. swipe down from the top of the screen, in the notification panel, you can see the notification ” Disable Ultra power saving mode”. tap it to exit the mode. 2. In the main screen, tap the menu key (3 vertical dots on top tight, below the status bar), then you can find 2 items: Disable ultra power saving mode, and Settings. 3. Pree and hold the Recents button (left to Home button), you will get the similar menu as explained in 2. Can you exit the ultra power saving mode now? Our original battery for our S5 (bought Sep 2014) seemed to be failing and we were having problems with MMS being viewed in our texts. We had not accepted downloads in a while and did so; there were quite a few. That solved the MMS problem, but in Ultra Power Savings the days remaining showed 2.8 @100% charge vs the 12 or so we used to get. So, new battery. It has been two days now and the most days remaining in Ultra Power Savings remains at 2.8. Also, to us, it seems to go lower quicker than it did in the past. We have turned off Wi-Fi and many other applications and seems to not make a difference. We can only guess why this is: Downloads caused? Something is starting to fail with the phone? Could you please offer your best analysis of this problem. Thank you. For MMS downloading issues, it is very likely due to message centre settings, not the battery. Your phone company can send you the correct settings through a message. For ultra power saving mode, the battery life will not be good if some apps do not exit gracefully. You may try to reboot the phone. BTW, why do you use ultra power saving mode daily? It is designed for emergent use, and many features will not work. If you cannot charge the battery, you can always get a spare battery for S5.